These unique items are sure to creat a soothing ambiance and be great conversation pieces at your next gathering, indoor or out. Alcohol gel fuel puts out a beautiful, "real life" flame that is wickless, non-toxic, easy to maintain, clean burning, and best of all, smokeless! 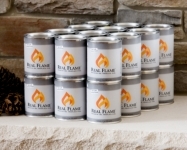 Each can of gel fuel provides approximately 3 hours of flame.